Lost amid the shock and horror of Friday's news was a remarkable op-ed in the Wall Street Journal by Louisiana Gov. 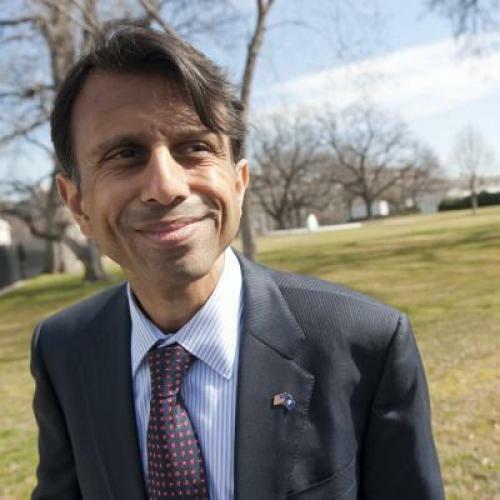 Bobby Jindal, who should no longer be called a "rising star" of the GOP. He commands attention by virtue of being smart, good at his job, and not a white guy. So it's significant that he chose to use his platform to break ranks with many social conservatives in his party by calling for over-the-counter sales of birth control pills. Of course, Jindal did so by couching his argument in a hyper-partisan defensive posture, lashing out at "Democrats [who] demagogue the contraceptives issue and pretend, during debates about health-care insurance, that Republicans are somehow against birth control." Jindal recognizes that the vast majority of Americans support the use of contraception, and that the issue of access to contraception is a loser for Republicans. So he proposes to take the issue of birth control out of the political arena by endorsing a proposal from the American College of Obstetricians and Gynecologists (ACOG) to allow adult women to purchase birth control pills over the counter. Women currently need a prescription to get birth control pills from a pharmacy. In the op-ed, Jindal praised the ACOG proposal as "a common-sense call for reform that could yield a result everyone can embrace: the end of birth-control politics." Republicans haven't traditionally been terribly supportive of ACOG, an organization many conservatives believe is too sympathetic to abortion-rights supporters. In her confirmation hearings, Supreme Court Justice Elena Kagan was questioned sharply by Republicans about her close work with ACOG during her time in the Clinton White House. And religious conservatives complained when they thought ACOG was insufficiently supportive of conscience protections for doctors who refuse to perform abortions. Jindal's new support for expanded access to certain contraceptives is also surprising given his Catholic faith. A spokeswoman for the Archdiocese of New Orleans said on Friday that, "We disagree with the governor's opinion because, as the Catholic Church teaches, contraception is always wrong." It's also significant because—despite Jindal's protests that Democrats have unfairly portrayed Republicans as anti–birth control—Jindal's own political background includes actions that could be characterized as anti–birth control. As a member of Congress, he voted in favor of removing contraception from health programs abroad funded by U.S. foreign aid, and he cosponsored the Right to Life Act, which threatened to ban many popular forms of birth control. Still, whether Jindal's column reflects a conversion or not, advocates who work to reduce the rates of abortion and unplanned pregnancy welcome such a high-profile politician to the cause. "This is just huge," says Sarah Brown, CEO of the National Campaign to Prevent Teen and Unplanned Pregnancy. "We need more people who identify themselves as opposed to abortion rights who are willing to find a way forward. This is a powerful way to reduce abortion, and he's saying you can be pro-life and pro-contraception." I doubt Jindal's call will be echoed any time soon by other Catholic Republicans. But a growing group of evangelicals has also been vocal this fall about the need to promote family planning. Evangelical Protestants don't have the obstacle of church teaching against contraception the way Catholics do. In fact, in 2010, the National Association of Evangelicals conducted a poll of its board of directors and found that 90 percent of them approved of "artificial methods of contraception." Given that position, the New Evangelical Partnership for the Common Good—a group that includes heads of denominations and representations from evangelical organizations like missions and universities—released a 13-page "Call to Christian Common Ground on Family Planning and Maternal and Children's Health" in October 2012. The document was very blunt: "The research is not ambiguous. Contraception is credited with preventing an estimated 112 million abortions worldwide each year." It's very hard to reduce the abortion rate, the group argues, without supporting contraception. As a result, they want conservatives to stop blocking funding for family-planning efforts that provide both contraception and abortion. It's unclear if Jindal would go that far. But if he wants to save his party from a losing issue, he'll have to do so.